Woodcarving readers have been visiting the annual UNIKA exhibition of carving, and we have featured highlights from the shows so that those of us who are unable to get to the Tyrol, can appreciate the exceptional carvings on display. 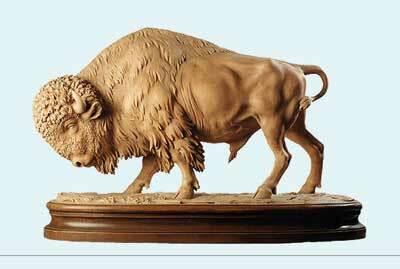 Among the many gifted carvers working there, Giuseppe Rumerio stands out as one of the world's greatest animal sculptors working in wood. Hidden away in a quiet corner of Ortisei - the home of the superb UNIKA exhibition - Giuseppe's studio is a shrine to his art and his fascination with nature. While being best known for his animal carvings, Giuseppe also has a breathtaking back catalogue of sacred carvings, studies of women - including the sculptural and beautiful supermodel Naomi Campbell - and a wide range of equally intriguing work. 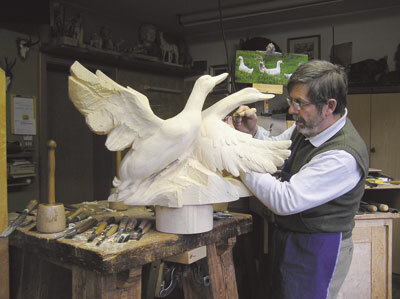 Carving in the region of Val Gardena is a 300-year-old tradition and ever since moving there from the Swiss border at the age of five, Giuseppe has been constantly enthused by the matchless work that is carved in the high Italian Alps. 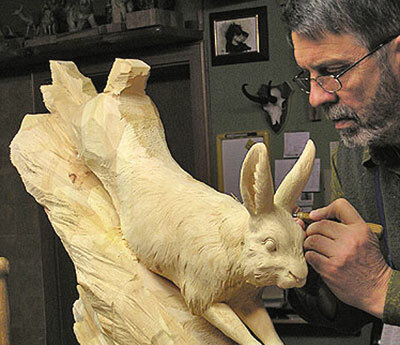 Giuseppe started carving at the age of 14 when he became an apprentice carver. 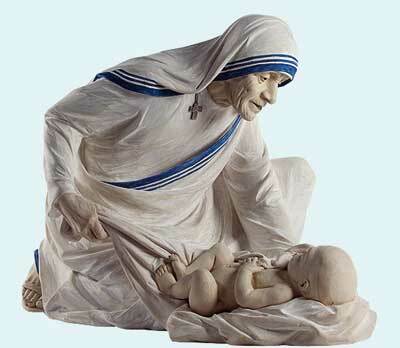 Now aged 59, he is a master-carver whose works are awarded the UNIKA marque to show that they have been carved solely by hand. Inspired both by the traditional carvings and the magnificent nature that surrounded him he says, "My first inspiration was nature, it now gives me all the inspiration for my works - particularly animals, but I also like to carve human beings. 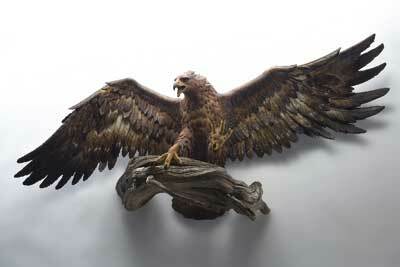 Some of my works are commissioned, other carvings not - I create them for the personal challenge and because I like it!" However Giuseppe has no 'one-size-fits-all' approach to his commissions. Rather he begins with a fresh approach to each new piece of work. "Each sculpture, while I am working on it, is a big challenge for me - I have no particular memory while working on it, each sculpture has to be studied before starting on it. I refer to books, pictures and most of all directly from nature." Giuseppe's carvings all share a dynamic, animated quality that demonstrates his ability to harness the characteristics of his subject. "Artistic ability is very important; the ability to draw helps you already in advance to create a beautiful art piece. 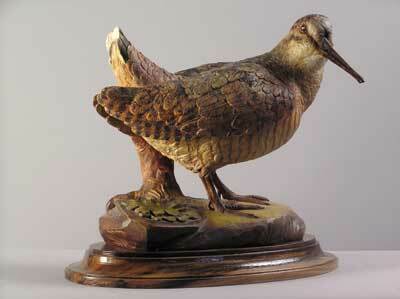 Historically, the French animal sculptors of about 1800 are the ones I most like." Giving an insight into his working practice he reveals, "I tend to work on several sculptures at once, it depends on the commissions, but sometimes I stop for a while on a sculpture, so it is easier to see the mistakes on it." There must be few mistakes because he is much in demand for his work. He says, "I get my commissions through email, through my homepage and most of the commissions are from old clients, loving my works." He enjoys living in such a large carvers' community, "We are not rivals; each one has a different carving style and different works. I also have to say that it is much more difficult to get orders because the competition is bigger. The quality of the works is higher." 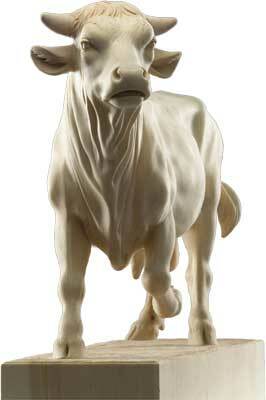 Though Giuseppe himself started as an apprentice carver he has none at present. He says, "A few years ago I had some apprentices. Now I work alone and I like it, because I have more concentration." Even so, he is concerned about the continuing tradition of the region's carving, "For young carvers it is very difficult to get their own style, you have to try a lot till you are able to find your own way and your own subject matter." 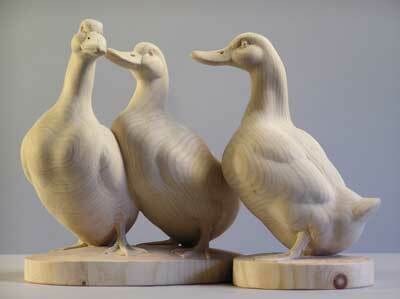 Pine wood is Giuseppe's favourite medium for carving, though he pronounces almost each wood as ideal to carve. The most important aspect for him is the authenticity of the hand carving, "Now the carvers are not so much anymore because sculptures can also be carved by machine, but this is an industrial work, not intricate like mine." He is currently working on carving dogs for the UNIKA exhibition this autumn but says that his ideal commission would be a group of life-size elks. 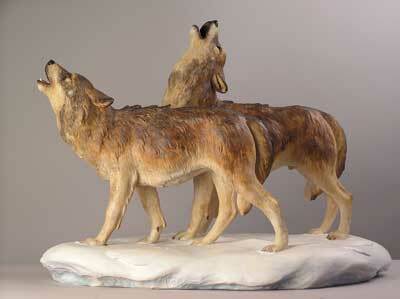 "If possible I would like to carve them in Canada, to copy them from nature. Canada has always been a big attraction for me, even if I have never had the chance to go there. I love the nature, the animals and the big areas with the quiet style of life of Canada. I think it would be ideal to concentrate while creating my art pieces. I have been teaching in Iceland for a few years - perhaps I might also get the opportunity to teach in Canada." Warming to the idea, Giuseppe announces, "If I weren't a carver I would like to be a hunter in Canada." 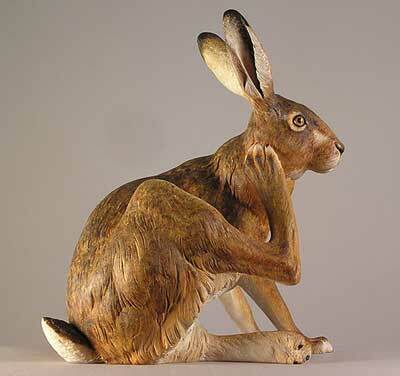 "My first inspiration was nature, it now gives me all the inspiration for my works"